The Philadelphia Eagles opened training camp Thursday, and now that we've gotten our first look at what players will be absent, and what players seem to be on schedule to play Week 1 of the regular season, let's take a closer look at the camp battles worth watching. To note, one of the most intriguing positions to watch this camp is cornerback, in terms of what type of role each corner will play. However, I wouldn't exactly call it a "camp battle," whereas the following positions will likely have definitive "losers" (for lack of a better way of putting it) in each competition. While the third linebacker spot is traditionally thought of as a "starting" spot, in the Eagles' defense under Jim Schwartz it's much more of a role player position, as the third linebacker will likely play less than one-third of the snaps this season, with a slot corner eating up that playing time instead. The three players in contention for that spot are Corey Nelson, Kamu Grugier-Hill, and Nate Gerry, who are all undersized linebackers that specialize in coverage. 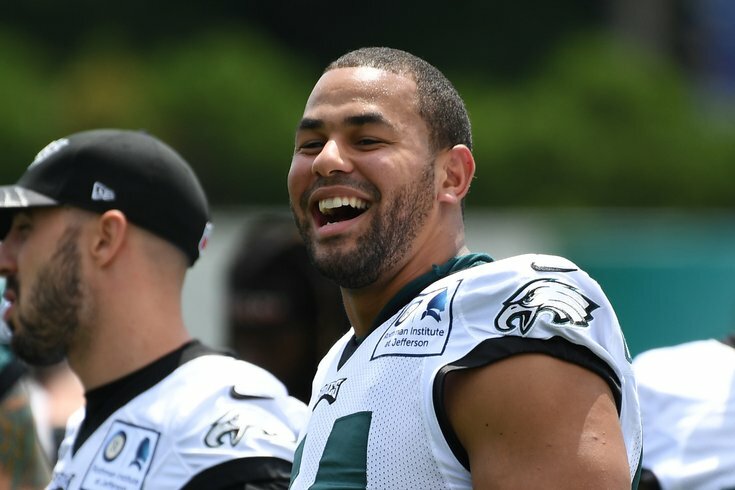 Based on snap counts, the "third linebacker" spot is arguably the 15th most important position on the defense, and it is probably the most straightforward camp battle that the Eagles have this year. • Josh Adams: Adams received the highest signing bonus in the NFL among undrafted free agents this offseason. He is a bigger back at 6-foot-2, 213 pounds who the team obviously placed a high priority on during the undrafted phase of the draft. Adams did not practice during the spring, but is ready to go for camp. • Matt Jones: Jones is a big, 230-plus pound back who runs through arm tackles and can help close out games in the fourth quarter, provided he can fix his fumbling issues. He would be the closest thing to a replacement for LeGarrette Blount. • Donnel Pumphrey: Pump was downright bad in camp last year, but he made the team and was eventually put on IR after Week 1 with a "torn hamstring." In camp last year, Pump didn't show impressive elusiveness, which is must for a player of his diminutive size. He does look a little bigger this year. Perhaps he put in some time in the gym. We'll see if that translates to a better performance in this year's camp. • Wendell Smallwood: You've all seen Smallwood play, so there's no mystery about who he is. Smallwood has shown glimpses of being a good runner for the Eagles, but he has had trouble staying healthy, and pass protection remains a concern. Cameron Johnston did not have a stellar spring, and the Eagles still have not brought in any competition for him. When asked if Johnston would be getting competition, special teams coach Dave Fipp noted (we're paraphrasing here) that Johnston is essentially competing against the rest of the league, which can be harder because you don't actually get to see your competition every day at practice. In other words, Fipp meant that if you can beat out some other scrub punter in camp, you might rest on your laurels, whereas the threat of adding some other punter from another roster might keep you on your toes. Johnston got off to a really shaky start on the first day of camp Thursday. If the season started today, the first safety off the bench if Malcolm Jenkins or Rodney McLeod got hurt would be 2017 undrafted free agent Tre Sullivan. With Chris Maragos on the PUP list, Sullivan is competing for that third safety spot against a trio of 2018 undrafted free agents in Jeremy Reaves, Ryan Neal, and Stephen Roberts. None of those players have any NFL experience in a regular season game. The Eagles still have to add someone, right? I mean, right? The Eagles have four locks at wide receiver. They are Alshon Jeffery (PUP), Mike Wallace, Nelson Agholor, and Mack Hollins. Beyond those four guys, the player with the best chance of cracking the roster is Shelton Gibson, who was among the active 45 on game day all throughout the playoffs last season. If the Eagles keep six receivers, they will have to decide between a veteran with some upside in Markus Wheaton, and a handful of young guys who spent time on the practice squad last year, including Greg Ward and Rashard Davis. To note, I don't see any of this year's undrafted wide receivers posing much of a threat to make the team. Kick returner duty is something of a question mark heading into training camp. In 2017, the primary kick returner was Kenjon Barner, who signed with the Panthers this offseason. Outside of Barner, the only players to return kicks last year (if we aren't counting Brent Celek) were Wendell Smallwood (4 returns) and Corey Clement (2 returns). A season ago, the Eagles were content to take a knee any time a kickoff reached the end zone, knowing that they had a great offense that they felt could drive the field from the 25 yard line. With the NFL adding an idiotic rule in which the kick coverage team won't get a running start on kickoffs, there's perhaps more potential for big plays on kick returns. It will be interesting to see how the Eagles adapt to that change. We'll project Clement to be the kick returner for now, since Smallwood has an uphill climb just to make the team, and it's probably too violent a play for Sproles at his age.